Sometimes, when we see someone’s success, we may feel inadequate. We may think that we haven’t accomplished much in life as others have. 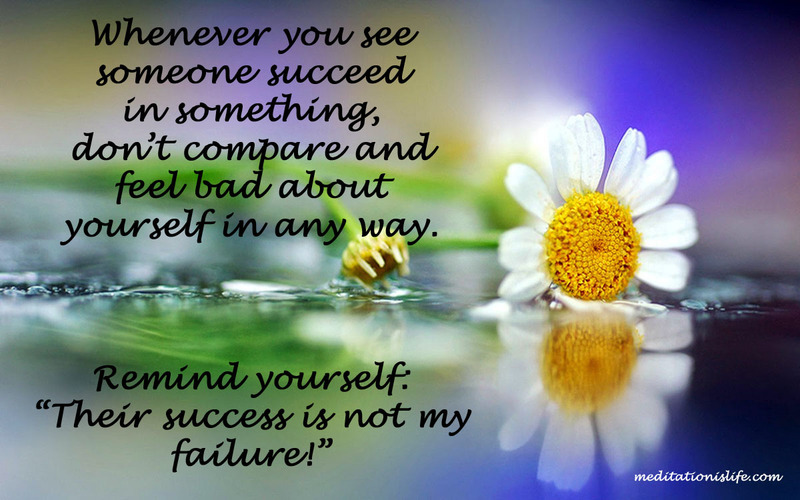 But it is important to know that someone else’s success does not mean it is our failure. We should only measure up to our own capabilities. Think about it. Why should we measure up to others? We don’t grow or wither away because of a success or lack of it. We are always the same. And what is it to us how someone else lives and what they achieve? The only thing that matters to us is that we lead our lives in the best way we can. Besides, we cannot always have success in everything that we do. Hence the saying, “you win some, you lose some!” All we can do to make the right effort and do everything we can to make something a success. But the outcome or the results are beyond our control. We may not be always successful, but we can always be happy irrespective of it. Also, comparing ourselves with others is illogical. There are so many different factors involved. It may not be a matter of talent or skill, but may be a matter of just having conducive environments and people around. Some may be so kind and sensitive to sacrifice their desire for a higher cause, or have restrictions and obstacles that prevent them from achieving their aspirations successfully. Most importantly, let’s look at it from the point of wisdom and truth. We may think that it is our will-power, efforts and talents that cause success or failure, but listen to what a great Sage, Ramana Maharshi, has to say about this to someone. This about sums it up. Q: What are the means for gaining will-power? A: Your idea of will-power is success insured. Will-power should be understood to be the strength of mind which makes it capable for meeting success or failure with equanimity. It is not synonymous with certain success. Therefore one should try to gain the equipoise of mind under all circumstances. That is will-power. Again, success and failure are the results of destiny and not of will-power. A man may be doing only good and noble actions and yet prove a failure. Another may do otherwise and yet be uniformly successful. This does not mean that the will-power is present in the one and not in the other.